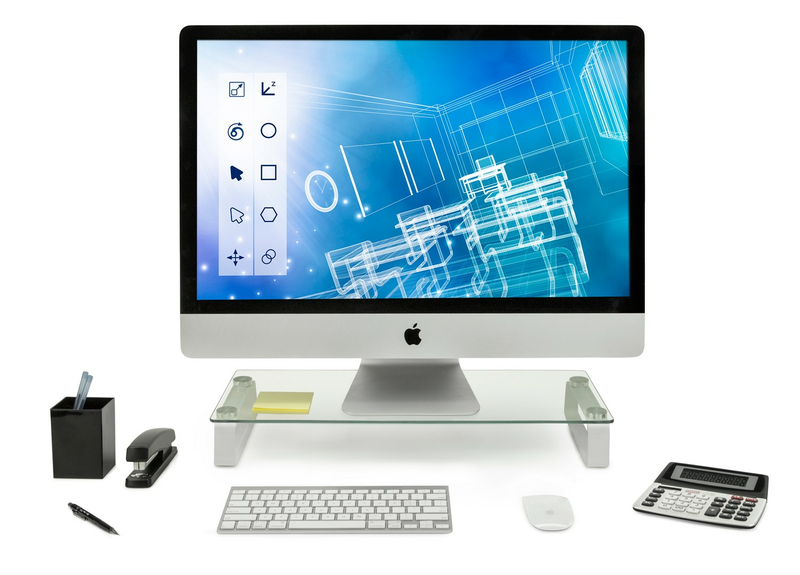 This elegant glass and Aluminum stand can be used as an office desktop stand for PC and Apple computer monitors or for other office equipment. It elevates displays by 2.75 inches. Creates additional horizontal surface under the monitors to store your laptop, keyboard or other office related document or accessories. MI-7262 uses premium Aluminum legs and 5 mm thick plate glass. Do not resort to cheap looking plastic and metal models that are selling at similar prices. The glass shelf is 5 mm thick. Overall assembly measures 22 inches wide and 8.3 inches deep. It is large enough for most computer monitors, laptops, flat panel TV bases, printers, cable set top boxes, streaming devices such as Apple TV, Roku, Amazon Fire TV, gaming consoles, DVD players and other audio and video components. Most computer users complain from neck and back pain after sitting long hours in front of a computer monitor. Elevating the height of the computer monitor from the desktop level to a more ergonomic higher elevation might help alleviate the posture problems caused by incorrect monitor placement. You can use one or two of these stands to place additional monitors side by side for additional productivity. Mount-It! experience and guarantee. Mount-It! is the expert in television mounts and office equipment accessories. We apply our decade long experience in this field to offer the best features at value prices. Contact our friendly customer support team for any questions or issues.